Borders Chiropractic was set up by Pamella Chu (Doctor of Chiropractic) in 2006. With strong family ties to the Borders and not many other chiropractors in the area, Peebles seemed an ideal choice to set up a practice. From the outset Borders Chiropractic has aimed to provide ‘patient-centred care’. We continually strive to expand our knowledge and expertise to provide good quality chiropractic care. As a rule we have always felt it important to spend time with our patients in order to fully understand their condition and ensure that they get the most out of the care we provide. Over the years Pamella has also been joined in the practice by other chiropractors and healthcare professionals. 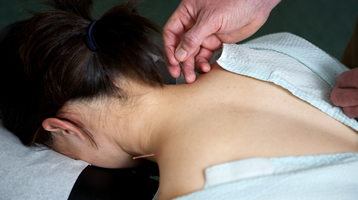 Currently Borders Chiropractic has 2 chiropractors both who also offer western/medical acupuncture as well as several other health care practitioners including massage therapists, hypnotherapists and a reiki practitioner. As a result of my treatment I now have no pain which after 7 years is a life changing positive. My back realigned into its proper position and an insight into how my body has been carrying the initial injury which has caused secondary and tertiary problems which have now been addressed. Both my wife and I have had treatment from Pam over the last 2 years since moving from Surrey. We had prevously had an excellent chiropractor in Surrey who made enquiries for us as we were moving and he recommended Pam. This has proved an excellent recommendation and Pam's experience together with her attention to detail, especially asking follow up questions and listening to your answers is a great attribute.